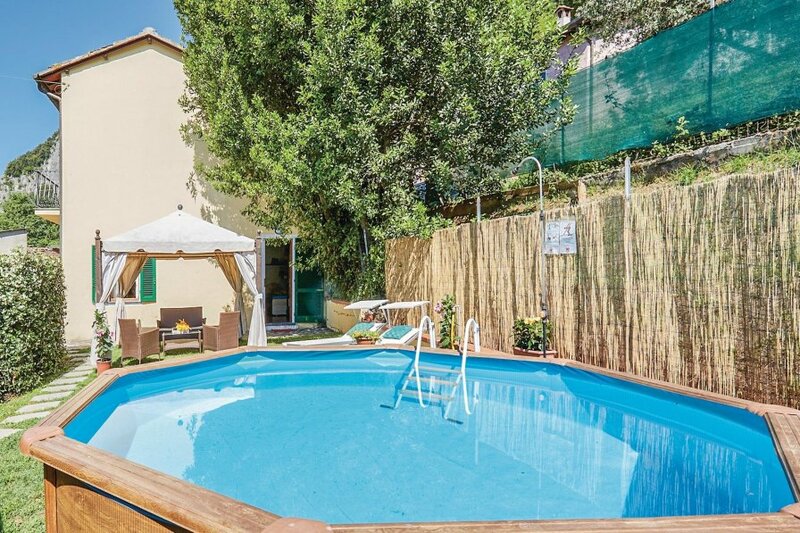 Beautifully furnished holiday accommodation at 2 km from Camaiore and 10 km from the beaches of Lido di Camaiore (tennis). Beautifully furnished holiday accommodation at 2 km from Camaiore and 10 km from the beaches of Lido di Camaiore (tennis). Those who enjoy walking can explore the mountains of Versilia and find here the remains of ancient civilizations. The house consists of a ground floor with kitchen, which is connected to a dining room, bathroom and small bedroom. Upstairs are two bedrooms and a second bathroom. The staircase connecting the two floors of the house is equipped with children safety gates on both sides. Outdoor area with private barbecue and a large pergola with dining table, an enclosed garden with lawn and a small above ground pool. Availability of electric kettle and children's games. This villa is made from brick or stone and was originally built in 1948 and refurbished in 2010. The agent has rated it as a three star property so it is a well-kept villa, equipped with standard furniture. It is also good value for money. The villa is only 2km from Camaiore. It is set in a good location, 9km away from a sandy beach. There's also a restaurant 1km away. The villa has free wireless internet. You can also park on-site at no extra charge. The villa is well equipped: it has a refrigerator, microwave with oven, washing machine and dishwasher. It also has a barbecue and some garden furniture outside.